by Douglas Hurt. Softbound, 432 pages, 6" x 9". The first major reassessment of Ohio�s frontier period in fifty years. 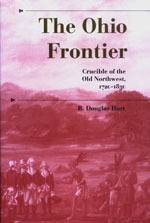 The Ohio frontier was a land of opportunity, violence, and refuge for both Indians and whites. It served as the political, economic, and social foundation for the settlement of the Old Northwest. First settled about 1720 by migrating Native Americans and later by white Americans, Ohio became the crucible for Indian and military policy throughout the region. Nowhere on the American frontier was the clash of cultures more violent than in the Ohio country. There, Shawnees, Wyandots, Delawares, and other native peoples fought to preserve their land claims against an army that was incompetent at the beginning but highly trained and disciplined in the end. This book will appeal to anyone interested in the history of Ohio and the military, social, political, and economic history of the American frontier.